Blog Home > AisleCop > AisleCop: Pedestrian or Forklift Priority? The reasoning for this choice is simple: it’s the same one that usually allows cars to have the right-of-way on public streets. It fits the operational needs of most warehouses and industrial facilities, but that’s not something that’s true in every case. Let’s go through your options for managing a pedestrian crossing in your facility using the AisleCop® system. 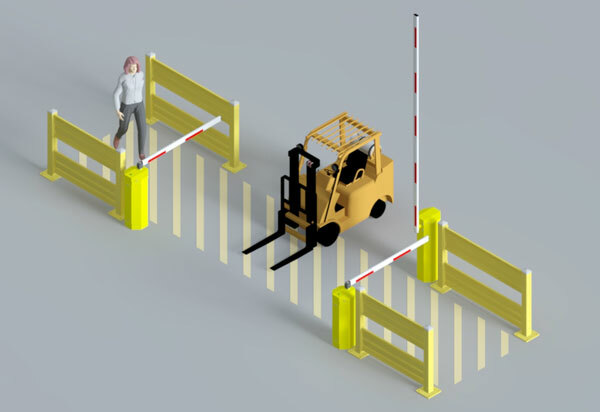 Forklift priority systems keep the pedestrian gates closed and vehicle gates open until a request to cross is initiated by a pedestrian, usually by push button. At that time, the system looks for approaching vehicle traffic. 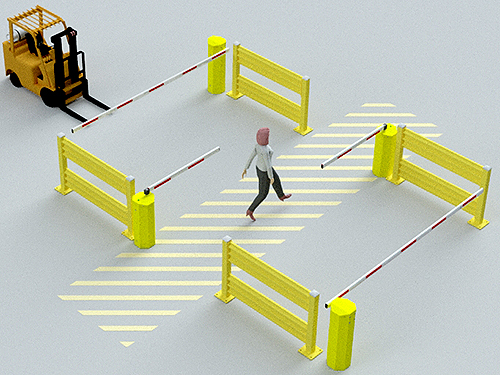 If no traffic is detected, it lowers the vehicle gates and opens the pedestrian gates. After pedestrians cross, the system returns to a normal forklift priority position. Forklift priority is the most common system type, as most warehouses want to let forklifts continue to move while they manage pedestrians with gates and sensors. This makes sense from a safety standpoint, and it’s why crosswalks are set (most of the time) to allow traffic flow until people can safely cross the street. It’s just safer for the people on foot than relying on vehicles to constantly stop. Also, loaded forklifts can shift loads if forced to brake, so it’s more sensible systems to allow them continue without interruption if possible. Pedestrian priority systems leave the pedestrian gates open at all times. They’re only closed when a forklift requests to cross or enter/exit. This configuration allows free movement for people, and forces forklifts to wait until they’re clear from the zone. When would you use a pedestrian-priority system? For low-volume areas with light forklift traffic. This might be a corner of the warehouse, but where traffic management is still desired. Areas accessed occasionally by forklift traffic or work cells with replenishment/takeaway needs. For intersections that are heavily trafficked by people, but have light forklift traffic. It makes sense to set the system for its prevailing use. During shift changes or lunch breaks, when you know there are many people crossing the aisle. It’s possible to build a system that changes its priority at specific times of the day. When you specifically need to slow down a forklifts in a particular area. In these instances, the intersection is best controlled by slowing down or stopping traffic in both directions. It’s not a common application, but it does happen. When it does, the system defaults to closing gates in two directions and has logic built in for when it opens. This can be triggered by a button, in-ground loop, etc. You implement an “all closed” system for very difficult or dangerous areas, or those where you just want to slow the pace in all directions. In other instances, companies will leave all gates open and close them only for specific circumstances. This might be situational, or might work for areas that typically have light traffic in both directions, but need to be managed when potential conflicts occur. Also, there are configurations designed to manage a work cell rather than a crossing, which may result in some mixture of open and closed gates. These applications can be triggered on machine usage, presence of traffic, button pushes and other methods.